'Sportscruiser' is a label often applied with little regard to its true meaning. 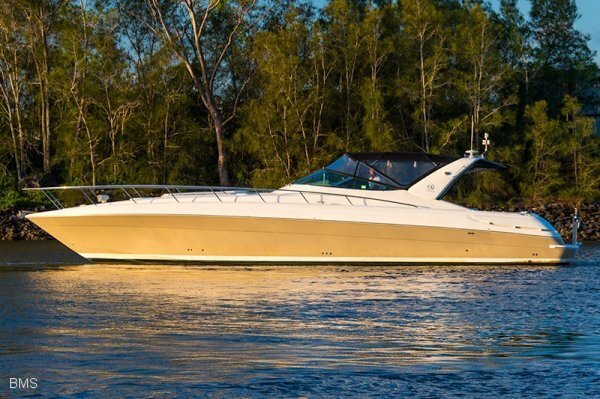 However, with the comforts of a cruiser and the get up and go of a sportsboat, the Mariner 430 is the real deal. Looks alone suggest the Mariner 430 has some sporty spice. It has a raked, swordlike hull with a fine but deep forefoot and less beam up front than your archetypal Mariner cruiser. Having said that, the sportscruiser is roomy. Electronics, a generator, air-conditioning, antifouling and an entertainment system come with the boat. Together with twin cabins, a galley and a saloon, plus a full-sized head, the layout forms the cruiser side of the package. Given the performance and the amenities, there's not a lot you can't do with your Mariner 430. Outdoor areas are sufficient to cater for family days at anchor or champagne cruises with clients. Accommodation will sleep a family of four in comfort. "Amazing offshore with that lovely waterline length and ease of power on tap! Only made better by being built by Riv. " "Still one of the best looking boats out there. Great design stands the test of time. " "My favourite from all the Riv family. " "Sexiest sports cruiser ever built. "